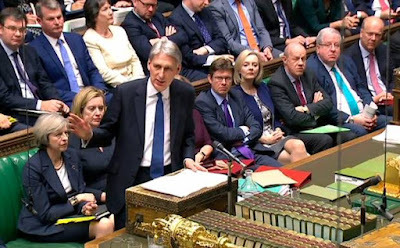 Yesterday, Chancellor of the Exchequer Philip Hammond delivered his first major fiscal presentation to parliament. Overall it was a somewhat underwhelming event, opting as he did for a 'steady as she goes' approach, rather than seizing the opportunities afforded to him by the referendum result. Nevertheless there were a few key areas that stood out. Firstly, as has been leapt upon by some Remainers, are the OBR projections that the economy will be £122bn worse off compared to George Osborne's projections in March. They claim that this is proof of the damage the Brexit vote has done to the economy, but fail to take into account several factors. To begin with, the OBR attribute less than half of that extra borrowing, £58.7bn, directly to Brexit. But in doing so, the OBR have had to make several assumptions, namely that Brexit will lead to increased barriers to trade, lower productivity, and lower investment. It's difficult to blame the OBR for making such assumptions, given the Government are still coming to grips with Brexit and formulating a plan for our withdrawal, but nevertheless, these are incredibly pessimistic assumptions based on a rough hard Brexit scenario. As this blog has argued repeatedly, such a scenario would be madness and is thus very unlikely to happen. Despite the panic induced by May's speech at the Tory party conference, there have been no indicators to suggest the government intends to press ahead with a hard Brexit. Those assumptions were based on May's stated desire to limit immigration, and jumping to the wholly false conclusion that this cannot be achieved if the UK remains a member of the EEA. What's more, we're increasingly hearing reports of an interim deal, which would see the UK remain in the single market in the short to medium term. Given this, the barriers to trade the OBR assumes in it's forecasts will fail to materialise and thus investment and productivity will be unlikely to fall too. In fact, given the safeguarding of our single market participation, coupled with the opportunities Brexit will afford us globally, there is the distinct possibility of these increasing, rather than falling. Even taking the OBR forecasts as read, they are still predicting economic growth, from 1.4% next year rising every year to 2.1% in 2020. This is hardly catastrophic and still a far cry from the 'instant recession' proclaimed prior to the referendum result. Most leavers acknowledged there may be a short term economic impact of leaving the EU. These projections show that, and also demonstrate that growth will return to normal after a couple of years. By then we'll be wondering what all the fuss was about. The biggest takeaway from the chancellor's autumn statement though is that austerity has been stillborn. George Osborne painted himself as the man taking the tough decisions to get the country's finances back on track, yet his cuts amounted to just 0.2%, the national debt now stands at £1.7 trillion and he missed every single deficit reduction target. Far from correcting this, Hammond has abandoned his predecessor's tentative plans to balance the books, announcing more spending and more borrowing. The jump will see the UK borrow £68bn in 2016/17, then £59bn, £46.5bn, £21.9bn, £20.7bn, and £17.2bn, with government spending representing, a still far too high, 40% of GDP. Moreover, the national debt will break an eye-watering 90% of GDP next year. The chancellor needed to be far bolder in his approach to a post-Brexit UK. His abandonment of fiscal prudency means that we will run a current account deficit for 22 consecutive years, and will still be living beyond our means 13 years after the financial crash. This saddles future generations with higher debt and higher taxes. His top down approach to dealing with economic uncertainty is a risky business. It would have been far better to implement tax cuts, rather than spending rises, to boost productivity. The continued freeze in fuel duty was welcome, as was going ahead with the reduction in corporation tax. But there was still a missed opportunity. A further reduction in corporation tax would send the message that the UK is truly open for business, and would help ease the inevitable uncertainty around Article 50 negotiations. Similarly, the chancellor has taken the wrong approach to the nation's housing problem. Abolishing stamp duty, liberalising planning laws, and reclassifying small sections of the greenbelt would do far more to help those struggling to get onto the property ladder than his announced spending plans. As Hinkley Point and HS2 demonstrate, the Government is woeful at picking projects with decent benefit to cost ratios. Far better to make it easier for the private sector to invest that money where it would be more effective. All in all, the Brexit costs are at worst, in line with what some Leavers said before the referendum, and still nowhere near the catastrophe predicted by Remainers. But the big take away is that between a far left Labour party and a Conservative party apparently fully wedded to Gordon Brown style 'investment', those voters who want simplified, low taxes, a vast reduction in state spending, and a fiscally prudent government, currently have nowhere to turn.